I do not support this new proposed Local Law! I am in the minority as only 5 of the 15 Supervisors have publicly opposed the resolution to end the County's current curbside collection of recyclable materials. 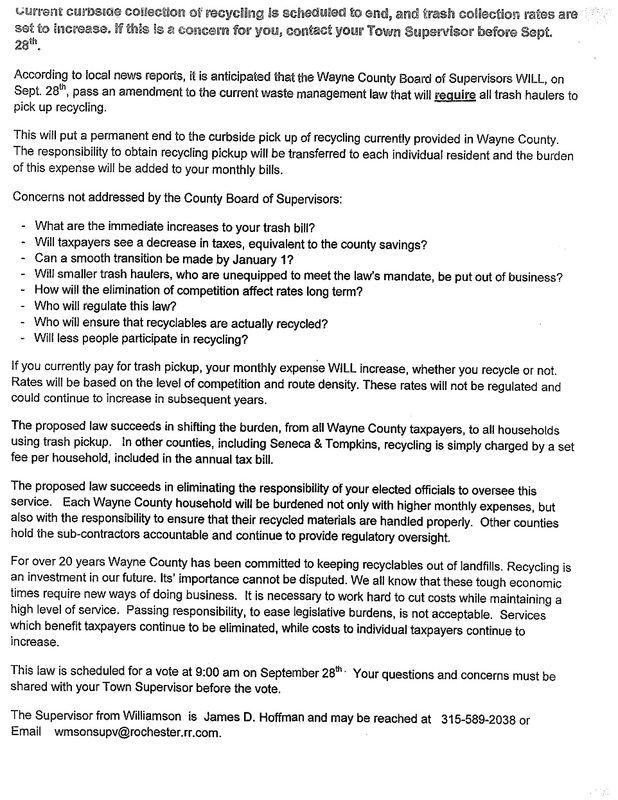 PLEASE join me in an effort to STOP this resolution from passing on the floor at the upcoming Special Wayne County Board Meeting on September 28th. Call or write/e-mail the Wayne County Board of Supervisors Chairman James D. Hoffman (see attachment) and copy me in on all correspondence. 10 Comments to "Elimination of Curbside Collection Will Burden Taxpayers"
in case you hadn't noticed. I DEMAND that you drive around my town and see the ABANDONED houses people that have been driven out due to our high taxes. If you want to keep then please do so and you can forfeit YOUR PAYCHECK to keep recycling a float me I am voting with my feet and leaving NYS as you are part of our problem. Here's your hat - what's your hurry? Your taxes will NOT go DOWN as a result of eliminating the county recycling program, however - your cost for trash and recycling pickup WILL increase! Good for you Mr. Groat! and our taxes will go UP guranteed if we keep it and not by a few bucks like my trash bill would. Don't forget mortgages go up with tax increases, I bet we will see a SUBSTANTIAL rise in taxes if we keep this program. Kudos to Mr. Groat! Taxes will NOT go down, but our trash pick up WILL go up, recycle or not. Our county recycling service is the best in the state, and it is a bargain for us as is! Be prepared Wayne County residents to cough up ALL of the replacement trucks. There is NO GRANT as it was lost after the last vote. So guess who pays to replace all those trucks. To Mrs. Kenyon ours is NOT the best in the state, I suggest you check out Tompkins county and Onario County they both do it better than us. keep recycling public. The need caused by the public for the public; taken care of by the public. I am always proud of this when guest from other states come and ask about it. 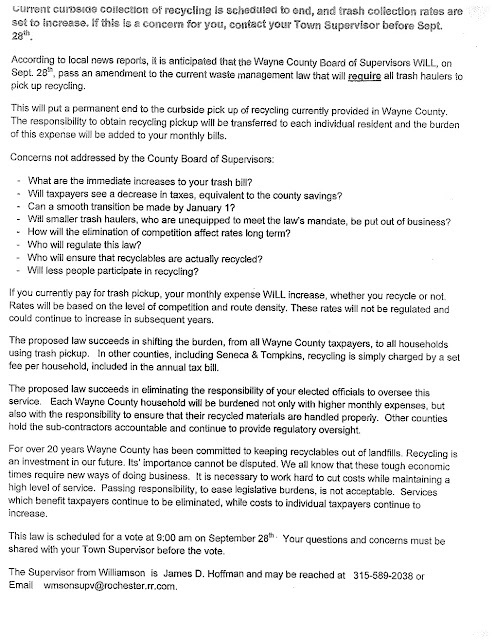 The current program of curbside recycling is a valuable, environmentally sound service that I would like to see maintained by our county supervisors. I would gladly pay more on my annual county tax bill for this service. Lowering taxes will NOT make the problem of environmentally solid waste disposal go away. OY then you can pay taxes too Gerry there are other options besides our recycling program. Do you know that some people don't support it and throw it in the garbage anyway. I would glady also pay for this service in my taxes. Shame on people that throw stuff away that can be recycled. We need to change the way we think in America. Such ignorance and a lack of highter thinking. Self centered with littly understanding of how we are connected to our envirement.